As part of a new interview series, I’m speaking to my favourite independent shops, makers, artists and interior brands. Kicking things off, I’m chatting to Claire Knill of In The Making. This week Claire is helping me celebrate reaching 7K followers on Instagram by running an exciting competition to win one of her gorgeous mobiles worth £175! All things considered, I thought it only right we find out more about this lovely lady. 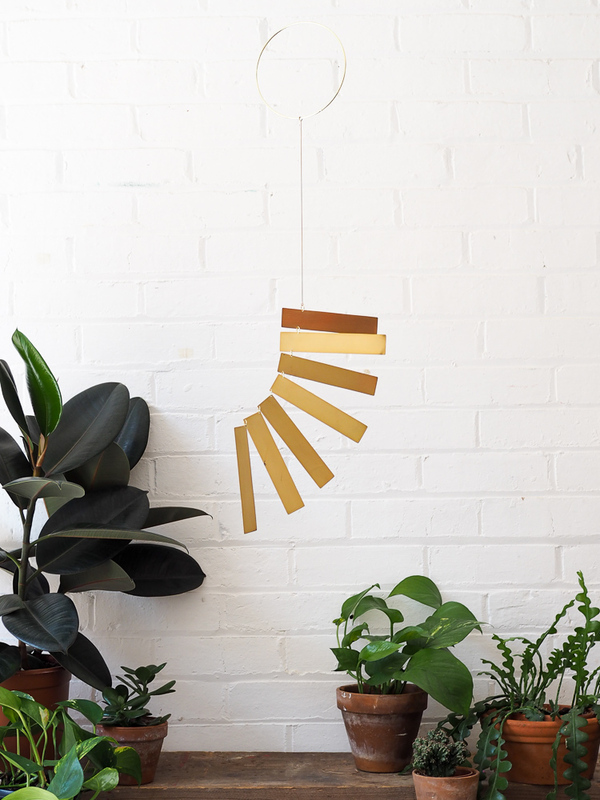 Claire makes stunning hanging art mobiles from brass and acrylic. Her work explores balance, movement and relationships between colour and shape. 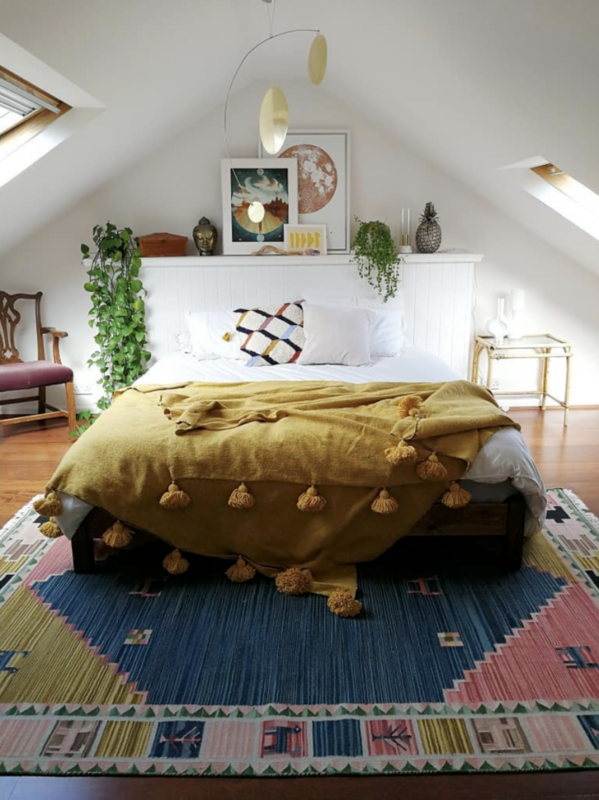 The mobiles are designed to bring a sense of calm to the space within which they are hung, providing a focal point to encourage reconnection, mindfulness and peace. Hi Claire, tell us a bit about you. “I grew up living in a remote cottage along a canal in Bath. As a child and throughout my life my Mum has been an inspiration and influence when it comes to making and creating. Whether it was homemade wine, our clothes, her own organic range of creams and oils, she has made for the love of doing. I have always admired her self-sufficiency and her curiosity of process. That all sounds eerily familiar as I work in PR but am always looking for new creative outlets. I’d also love to launch my own brand one day. When did you launch In The Making? How did you come up with your brand name (which I love by the way!)? That’s brilliant and very apt! 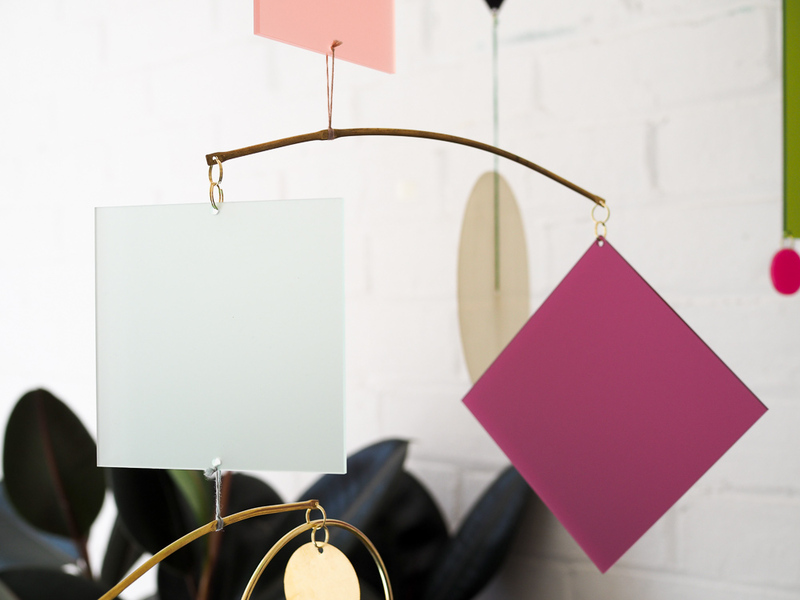 Where did the idea to make ‘grown-up’ mobiles come from? 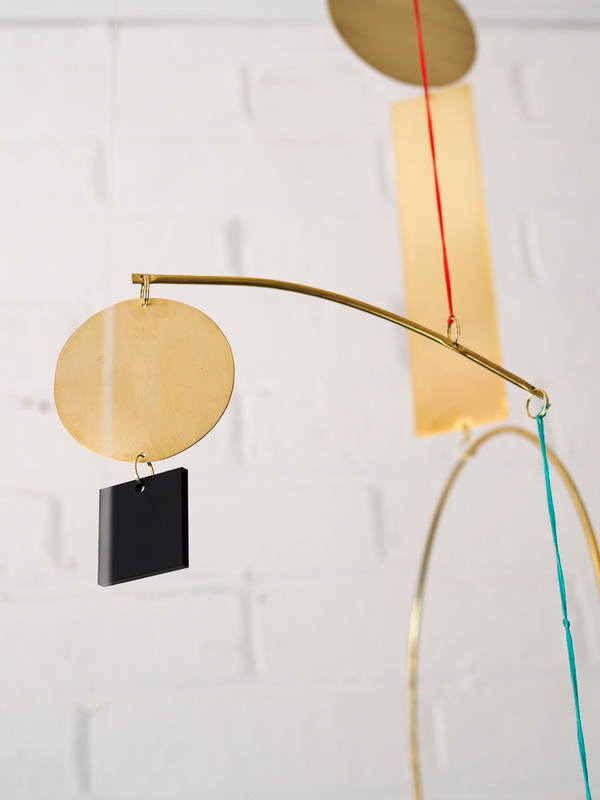 “The mobiles developed out of other wall-hangings was I making, experimenting with different materials and movement. I never sketch or plan too rigidly in the first instance, I prefer to pick up materials and manipulate them. 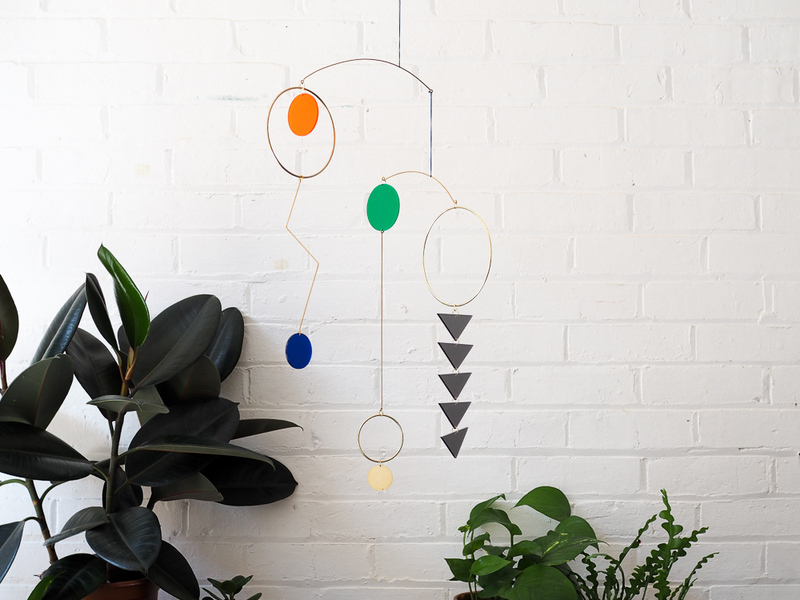 “What I really enjoyed about making mobiles was learning to make them balance, having to sit back and watch the way they move to make sure the flow is right. This became a way for me to find a calm space to stop and focus, I have a very busy brain and find that I have lots of ideas crashing around up there, it helped distil and simplify. Finding time to carry out this work, means I find it much easier to live in the moment and deal positively with the challenges that come from a busy family life, akin to meditation I guess. I love this and totally get it since I was lucky enough to have been given a beautiful brass mobile of yours for Christmas. It’s beautifully mesmerising and reminds me of planets orbiting the sun. And as strange as it sounds, I love the completeness of circular shapes. Please tell me more about this particular design! “Aah, I loved creating this design. It’s called Sisters. The starting point was the idea of really simplifying things down to celebrate the circle, I think it’s such a powerful shape. I also wanted to experiment with a more non-traditional structure for a mobile. “During the making process, it came to represent my sisters (I am one of three girls). The three elements are connected but independent and there is a simple sweeping curve that holds them together. It symbolises how important our relationship is to me. We all live in different cities, so I don’t see them as much as I would like but I feel very close to them and really value their love and friendship. It one of my favourite pieces of work. That’s so lovely, I’m glad I asked. I love the family connection, plus it’s obviously great to know I’m not the only one with a thing for circles! What other items do you design and make? “Shape, form and colour found from all sorts of random places. I love geometric shapes, lines and curves and playing with scale. I have collected lots of tribal textiles and objects from my travels which often inspire shapes and patterns I use. The women of the Bauhaus movement were incredible. I’ve noticed you use a lot of brass in your designs. I’m a big fan of brass as a material. I love the colour and how it stands the test of time but demands a bit of love and attention now and then. What do you love about brass and how do you find working with it? “I love the quality of the surface that brass has and the fact that it tarnishes and ages over time. All my brass pieces are hand finished. I love the different textures that can be created and the way this changes the light that reflects across the metal. 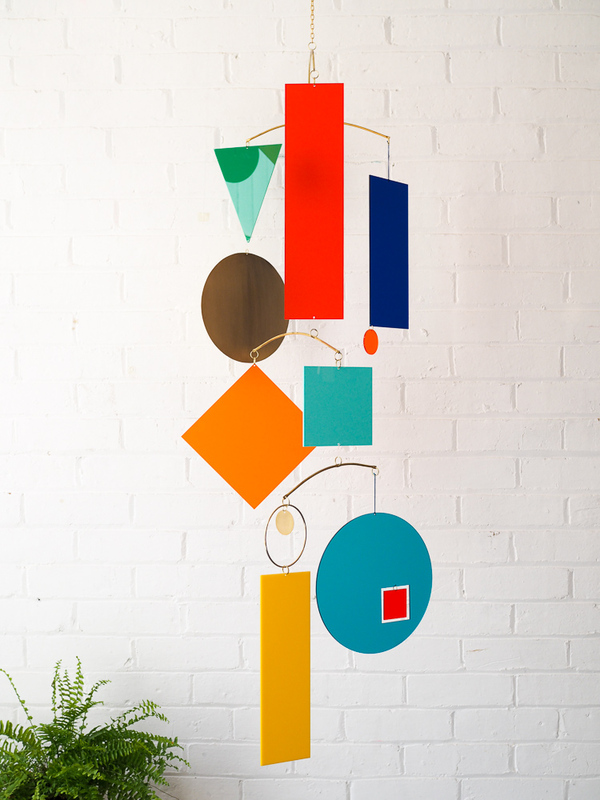 You also create mobiles made with bright colourful acrylic shapes. They’re so fun but give off a different vibe to the brass designs. How do you differentiate the two? Do you see them differently or were they made during a different time or mood? “This is a really interesting question. 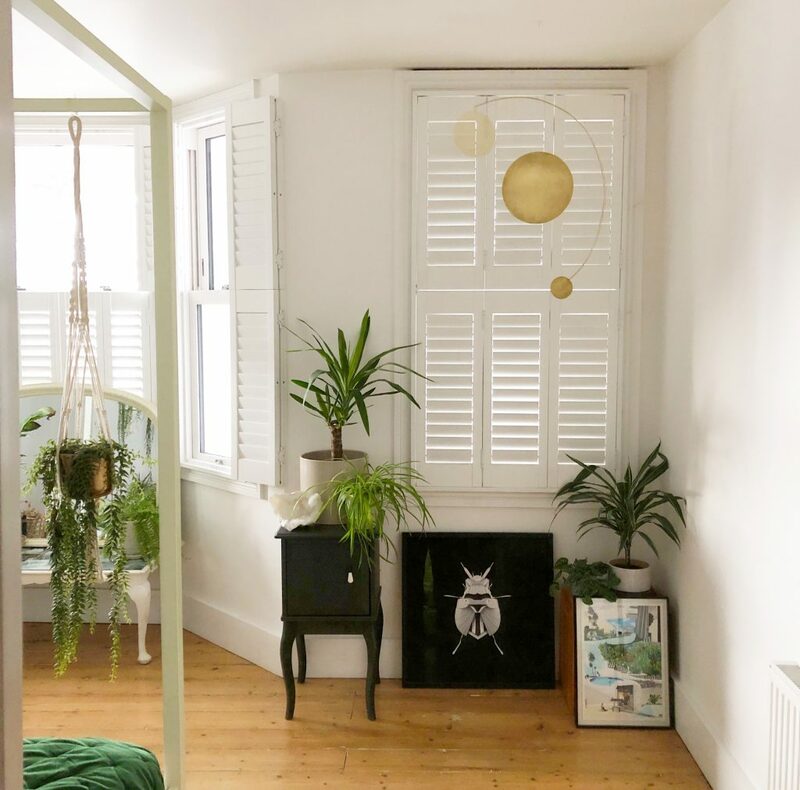 They are quite different, my brass pieces have a calm more ethereal quality whereas the acrylic is playful and vibrant, they tend to be the statement pieces. Thinking about it, this can often be representative of the mood or energy when making a particular piece, either how I am at the time or how the piece makes me feel while creating it. That said I love combining the two materials and they have such different qualities that work well together. How long does each piece on average take to make? Do you ever name any of your pieces? 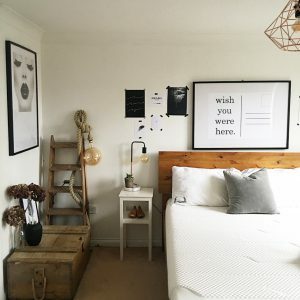 Which pieces of your own work do you have in your own home? 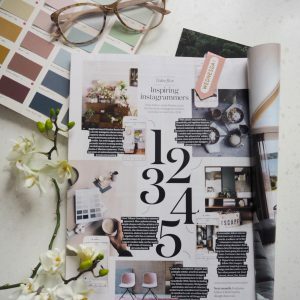 Is your personal style reflected in your work? How would you describe the two? How do they differ? Tell us about your studio. How to you get in the zone? “My studio is my sanctuary. It’s an old stable with super thick walls so it’s cool and calm. 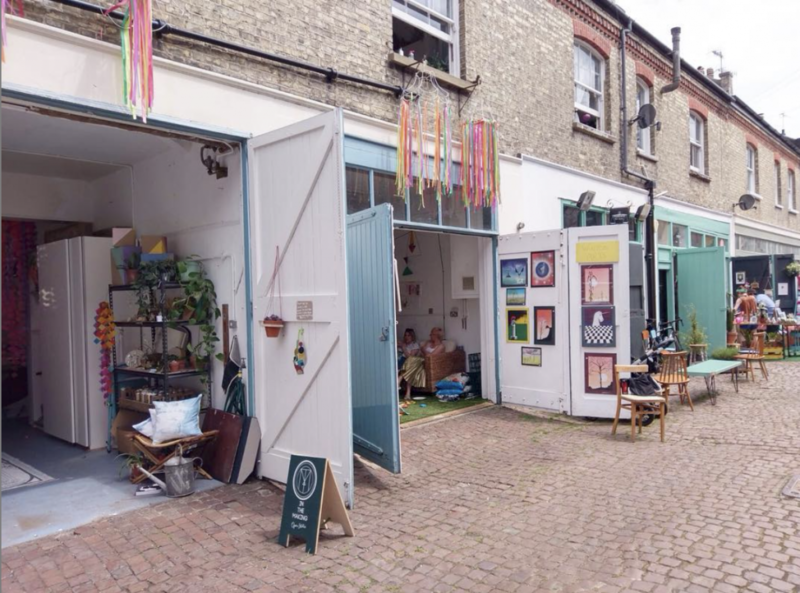 I live on a mews street in Hove (my studio is on the ground floor, we live above it) so I can either close the doors and escape or open them up on sunny days and be sociable. We’re lucky to be among a lovely community of indie businesses and neighbours. 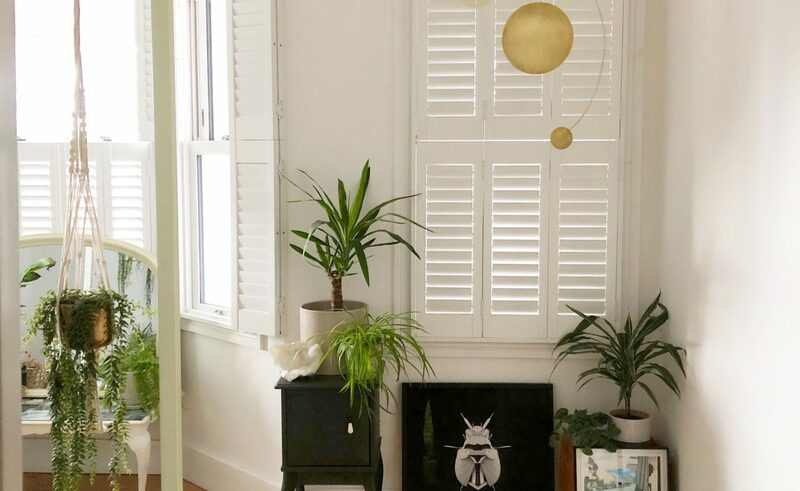 “Usually I get up super early on a Saturday morning and head in there before the kids and world is awake, tunes on and an awesome coffee from Pharmacie Coffee roasters next door to fuel the productivity. I find it must easier to focus on what I’m doing at that time in the morning with a fresh head. Yes! Think I need to adopt that one when Liam tells me off for being messy! So whether your styling work or pieces for In The Making , what item do you get most enjoyment from making? What’s been your most notable work accolade? That’s pretty amazing. You know you’re doing a lot right when Sotheby’s call! 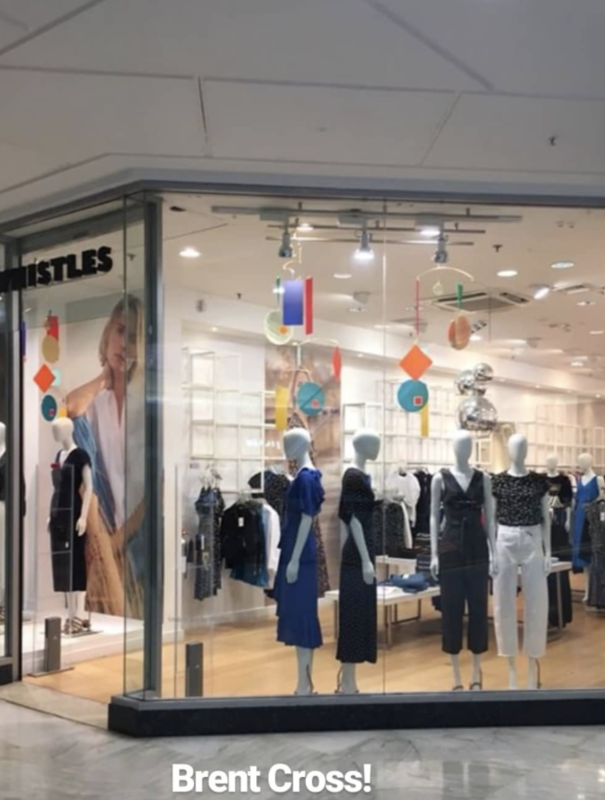 I saw from your Instagram that you created a number of window installation / displays for Whistles stores which all looked so good! How did that project come about? “Yes, a dream project! I was thrilled to be approached by them. 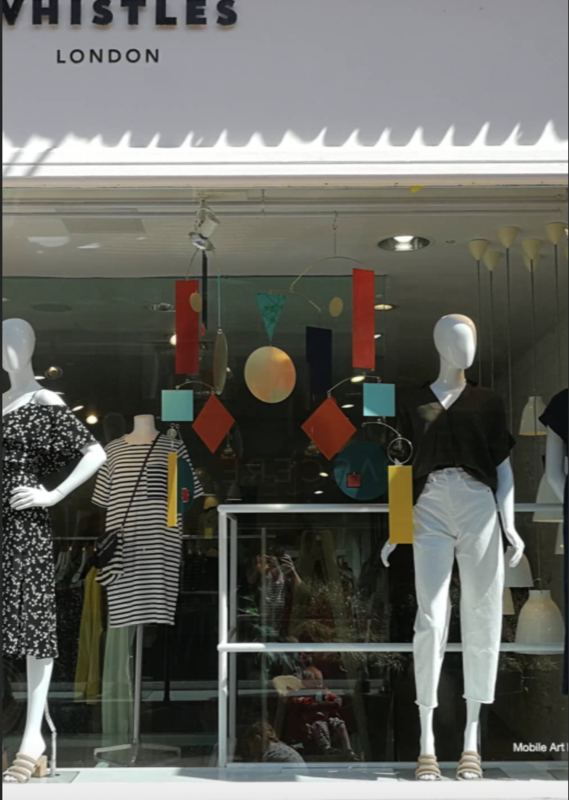 The team at Whistles had seen my work on Instagram and asked me to create some mobile art for their summer window display across all their stores (100 mobiles in total). I know from experience, working on your own can be lonely at times. Do you mix with other creatives and makers? Which networks do you tap into or are you a part of? 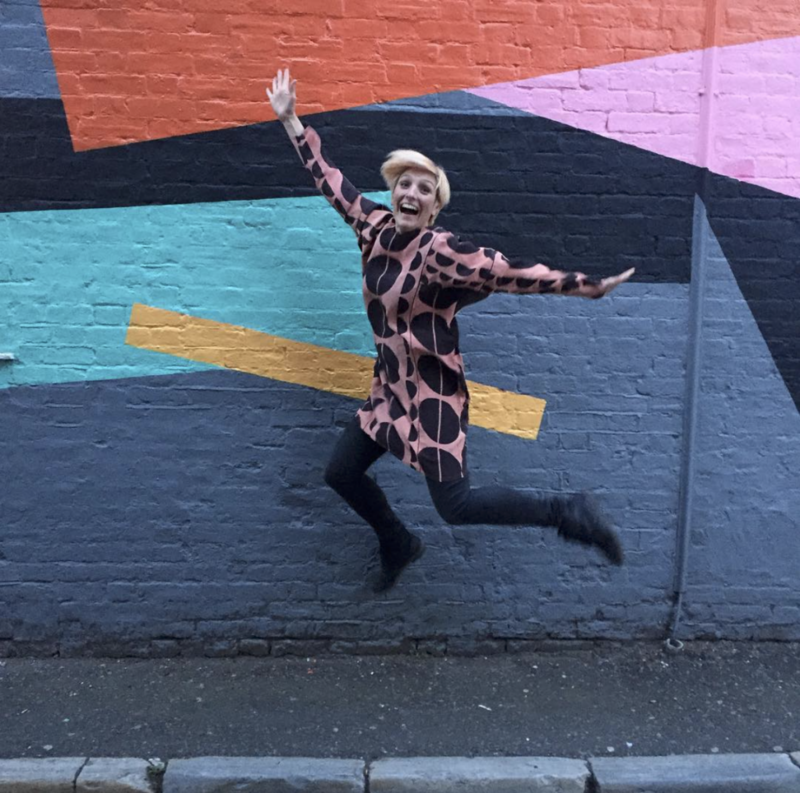 “Brighton has an amazing and accessible creative community and I’ve made some super friends here, often through events I’m working at or markets. 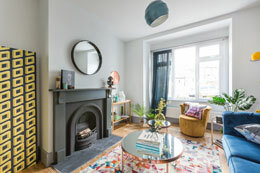 The Brighton Etsy team hold regular meet up which I try and go along to, and the Happy Start Up School plan really valuable networking events. I’ve been part of a mentoring group before and I found it really valuable. Good luck with it! One last thing before you go, can you let us know what you’re up to at the moment and what’s next In The Making? All sounds very exciting, looking forward to seeing it unfold! If you’re interested in winning one of Claire’s In The Making mobiles, head over to Instagram for competition details and how to enter. The competition runs until 9am on Wednesday 4th February.